Sure, travelling overseas is fun, but why not explore our own backyard? Canada has so many beautiful landscapes, quaint towns, and adventures to try that it might be impossible to see them all in a lifetime! One thing’s for sure – we are willing to try! Here are a few tips for first-time renters hoping to test out an RV for a Canadian stay-cation, plus links to handy trip-planning resources to check out before you hit the road! Who should you rent your RV from? There are many dealers in the Go RVing Canada family who rent RVs in Canada. You can browse our RV rental map to see what your options are available in your area. Check out our our handy RV rental checklist to help you find the best option for your family! Always plan your trip ahead of time! Especially on your first time out, you will want to know what direction you’re heading in, where you will park your rig each night, and which road is the best route to get there. Beginner RVers should also take some time to get familiar with their rental rig. As for campgrounds, review the rules and regulations for your campsite. While the rules are generally similar across the board, some campgrounds might have unique restrictions. The best way to pack: bring a bit more than the basics. You don’t want to overpack, but you also want to feel prepared for any adventure that might come your way. When preparing for your trip, be sure to consider factors like the weather and outdoor elements at your destination. Will there be bugs? Rain or shine? Should you throw a few extra blankets into the vehicle for that extra bit of warmth at night? 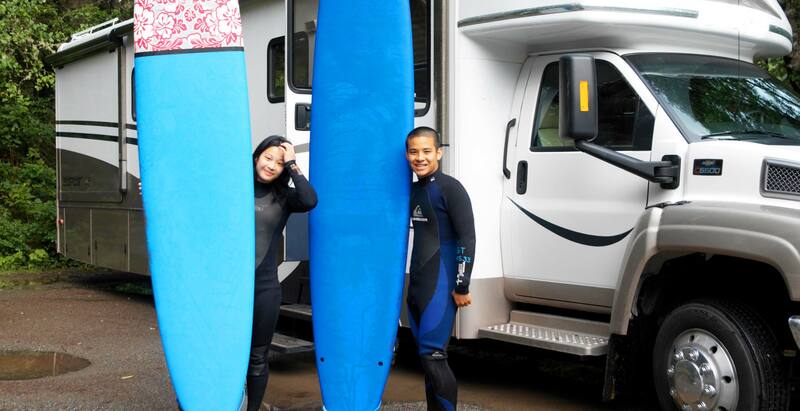 Does your campground have a washing machine, or should you bring extra clothing just in case? Also, think of what activities your family has planned. What sporting gear or equipment will you need to bring along for each activity? Still not sure what to pack? Watch this video for quick packing tips to help keep your load light on your next RV trip! For starters, there is camping etiquette you can brush up on before you head out on your first RV trek. And it’s a good refresher for seasoned RVers, too! Make a good first impression for your fellow campers. We also have a complete roundup of a few recipes we think you might like to try while on the road. Check out our ooey-gooey camping recipes and fuss-free campfire meals. Rain showers forecasted for your trip? Keep these rainy-day fun activities in your back pocket to keep your crew happy and entertained in case it rains during your RV trek. Bringing your fur babies along for the ride? We have some helpful tips for travelling with four-legged friends. There are quite a few pet-friendly campgrounds in Canada. And here are some simple ways to make your road trip a little easier with Fido on board. First time camping in an RV? We have tips from seasoned campers, too! Are you joining us for #CampingWeekCA in support of Make-A-Wish Canada? What better time to head out for a stay-cation in the great outdoors? !